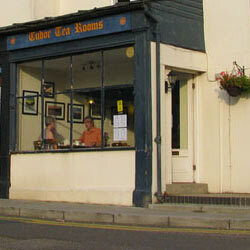 This page has stuff related to our café (or Tearooms - whatever you want to call it). Here you can see what we're making and what we're up to. We also post special offers and discounts here so it's always worth checking back! Find out more on the About Us page. Sincere apologies for a lack of updates of late – I’m afraid between being super busy and having endless problems with our provider, it’s been tough. Hopefully we can change all that. In the meantime, this is a reminder to everyone that Today (Friday) is our last day open before we close for some maintenance. We’ll re-open on Tuesday 11th September. If you see us pottering about in the café, feel free to wave, but please don’t point and laugh! To make up for our closing, you can take advantage of our offers for today – 20% off frozen meats, 30% off frozen sausages, and up to 50% off some of our cheeses! Our apologies for any inconvenience caused by our closure (we’re sure there’ll be some), and we’ll see you when we re-open. Most restaurants accept bookings as it can be a real downer to get to your restaurant of choice and find there is no room for you and that your whole evening is ruined. Our place is a café rather than a restaurant – it’s a friendly, relaxed and informal affair. Recently however we’ve had a few grumbles from customers getting turned away; it must be frustrating to be turned away from what appears to be a half empty café. Since we are open during the day and don’t have a narrow window of evening services, it’s very difficult to guarantee a reserved table without leaving it empty for anything up to an hour beforehand – this simply isn’t sensible from a business perspective. So we’ve taken the difficult decision to refuse bookings from now on. We know it will be an unpopular choice with some people and we are truly sorry for any inconvenience it may cause. However we also know it’ll be good news for lots of people that like to pop in on the spur of the moment. It’s a tough job to balance this kind of thing – please forgive us for doing our best! This is just a quick post to mirror the letter in the shop window. First of all we’d like wish all of our Wivenhoe customers, visitors and readers a very Happy and prosperous New Year. We’d also like to thank everyone for their continued support and enthusiasm for our business. We occasionally grumble about the hours we work but we wouldn’t do it if it weren’t for the fantastic people we get to see every day. We’ve been here for 8 years this February and while some have been harder than others, all have been worth it. Thanks for sharing our passion for good food! The café will be operating as usual up to Friday 23rd December. It is then closed until Tuesday 10th January. We apologise for any inconvenience and will see all you good people of Wivenhoe in the new year! Christmas Eve (the 24th) is a Saturday and will no doubt be extremely busy, so make sure you have put in your order if you want to avoid long delays! We will be CLOSED on Christmas Day, Boxing Day and Tuesday 27th. The Deli will then, just like the café, be CLOSED until Tuesday 10th January. Again, apologies to everyone for having to deprive you of fine food for so long, but there is much paperwork and even a little repainting to be done! Winter seems to be late; it’s cold but still not cold. Regardless of the temperature, the seasons have changed and we switched over (a couple of months ago actually) from summer salads to winter soups. The soups are made right here in the Deli kitchen – zero ‘food miles’ (that’s not exactly how it works, but you get what we mean). Katie puts the industrial ‘thunder-stick’ blender to good use and knocks out a wide range of incredibly tasty soups. Soups are a very simple product and as such the quality of the ingredients is immediately noticeable – for good soups you need good stuff. We always buy English veg where we can, meats are always local and free-range, and any cheeses are – well, let’s be honest, they’re awesome because cheese is pretty much what we do. The range of flavours varies depending on a couple of things – availability of produce, or more often, what Katie actually fancies making. The flavours pictured are Broccoli & Stilton, Carrot & Coriander, and Curried Parsnip & Apple. Other flavours include Potato & Leek, Gentle Lentil, Spicy Tomato & Lentil, Tomato & Lentil (not spicy), Tuscan Bean & Vegetable Stew, Spiced Butternut Squash, and quite a few more but it’s probably getting boring reading this list, so we’ll leave it at that. The soups are sold in single servings and are in those lovely, eco-friendly, “I can’t believe it’s not plastic” pots. Feel free to chuck them on your compost heap if you so desire, or just throw them in the bin without feeling guilty. We sell the soups fresh but also try to keep a range in the freezer. There’s usually at least one soup on the go in the café and since it’s hot, we also sell it as take-away in the deli. There’s plenty of soup, so why not stew yourself a favour and try some next time you’re in! With almost all of the Christmas stock now in, the only thing that remains for us to do is make it easier for you to buy the stuff. One of the best ways we’ve found is to offer up gift certificates for both the delicatessen and the café (or tearoom, whatever). This year we’re offering Wivenhoe a selection of vouchers. There’s £5, £10 and £20. What’s even better is that these vouchers can be used on either side of the business, so it doesn’t matter if you want to knock a little off the bill when bringing the family out for lunch, or just treat a friend to a delicious bottle of wine. The vouchers will be on sale from Wednesday, 23rd November. We’re also going to start taking Christmas orders on the 23rd; in addition to placing your order next time you visit the deli, we’ll also have order forms available to pick up, download, print out, etc. Or you can just e-mail us. Whatever is easiest for you. Unfortunately we don’t have the space available to provide Turkeys this year, but the rest of our range is available as usual. Be aware that Christmas Eve is bedlam in the shop and last minute attempts to obtain a full cheeseboard can often be in vain, so make sure to order early! In addition to the forms, the Christmas section will also highlight our holiday opening hours, so don’t forget to check back.